o ya offers an a la carte menu and two omakase chef's tasting menus, which include a variety of seasonal and contemporary sushi and sashimi dishes, followed by a few cooked, savory courses and desserts. Please note any specific dietary or time restrictions when making your reservation. My overall rating is just below a 4.
i indulge in a lot of high end sushi and japanese food, as well as other types of exceptional dining. I enjoyed the overall experience and the inventiveness of the omakase dinner. There was a certain earthiness in the food design that I appreciated. At the end of the meeting I was surprised to not feel more full after an 18 course omakase dinner, although I do have a good appetite. 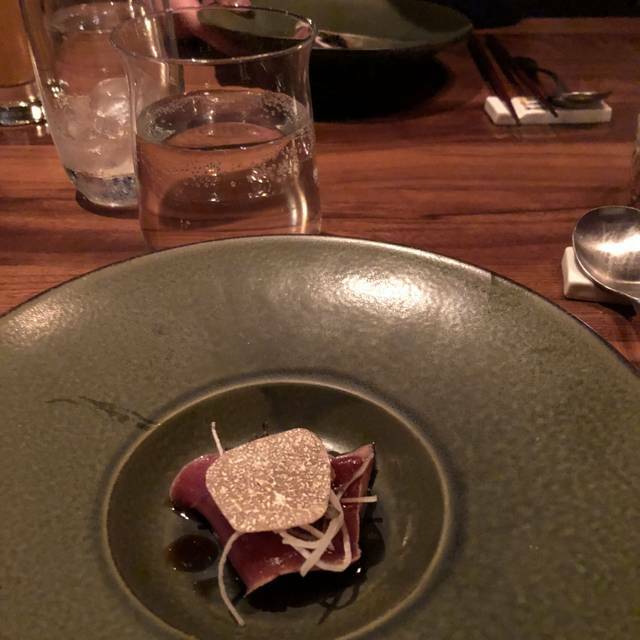 I ordered several more courses and left at about $300 with drink and not fully ‘satisfied’. One additional issue, small as it is, when eating a multi course dinner i dislike having the serving plate pulled off the table as i am still chewing the course it was served on, sometimes efficient service can feel insensitive, like one is being rushed along, instead of being supported to linger over an exquisite course. An outstanding all around experience. Ambiance is nothing out of the ordinary but very much shows Japanese elegance and restraint: no wow, but the enjoyment of something simple and perfectly suited for its purpose. The quality of the sushi is second to none. Our waiter was super efficient (we had a deadline and a plane to catch and he stuck to it perfectly) while still extremely nice, attentive and efficient, working well with another waitress (sorry I did not have the name, they should both be commended). I am a regular high end sushi eater but this wins the price through its sensible innovation, restrained yet pleasantly surprising. I am a huge fan and will come back at every opportunity (I do not live in New York). I would only like the wine list, especially wines, to beef up, notably in Californian Chardonnays. The food is very delicious! I like it. I ordered 24 grand menu. Overpriced, over seasoned, and just overall not good. For having a 9.4 on infatuation I was beyond disappointed. The wait staff was fantastic but the food was terrible. I will not go back and will not recommend again. As a avid sushi lover who seeks out the best sushi in the city I could not have felt more disappointed. Always a great experience at O Ya. Been to NY and Boston locations many times and always walk out loving it even more! Overpriced and left hungry after Omakase. Would avoid! 5 stars in all respects - the flavors are spectacular, the menu has a wide selection for every diet, the service is great, the presentations are artistic and the sake selection covers the full range. The price may be considered high but "you get what you pay for". I think that this (and the Boston branch) are among the best sushi restaurants in the world ! Food was good but over priced. Would not recommend or return. Much better places at better prices. Pricey, but worth every penny. Incredible rice, really notable, even for a high-end Japanese venue. Tried several small bottles of saki - all wonderful though no two were really alike. The wait staff, though predominantly Anglo, were totally on top of an exceedingly diverse and complex menu. Kudos to the owners for creating this lovely food experience. Our third visit. We were previously in love with O Ya- but this visit was a very pricey miss. We had the delicious 24-course chef tasting. All courses come dressed (sauces) - but our first few were almost inedible due to the wasabi. 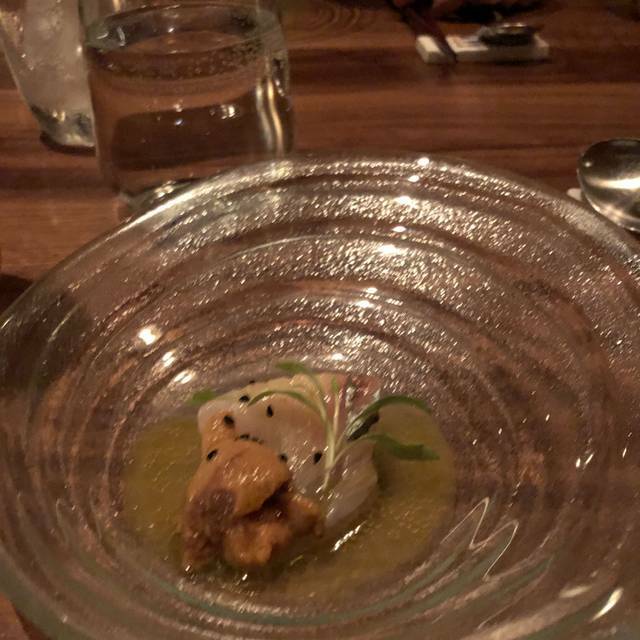 We asked after course 3 to have the chef tone it down, but the following courses that contained wasabi were over powering. I like wasabi, but my eyes should not tear and I should be able to taste the fish. What was most concerning is that our requests to ease up on the very pungent addition went unaddressed. Sadly, I don’t think we will return. So I was there for dinner with my boyfriend. After 2hrs and half we decided to speed up the process and skip one or two main courses and have our desserts directly. We told at least two waiters directly for at least three times, and it was very clear that “we want to have our desserts now”, and after 10mins all we had was one course and a check. We checked again with the waitress and she was like “OMG I thought you wanted to cancel the remainder courses. We spoke very clear and I am sure they know what I need to do and they even repeated after me. I love Oya and this is probably the fourth visit of mine, but unfortunately it will also be my last one. The Resturant was ok. Service was excellent. I think the rice wasn’t done correctly, it wasn’t served warm and it was undercooked. Too many dishes are torched and they use too much truffle oil and truffles on things. Overall I would go there again in hopes that the rice would be done correctly. A thousand dollar dinner for 4 should be a little less 'frat house' and a little more 'temple'. We went there and they were out of 3 items on the menu. The cost and portions are very small and expensive. Great place for a foodie/chef that wants to be inspired... but not a place you keep going back to. Over all just taking themselves too seriously. Food was quiet good but not worth the price listed. Service wasn’t impressive but was ok. The open table app said the restaurant was reasonably-priced (31-50US$) range. When we got there we realized that all portions were really small and the price was unusually high. In addition, the menu had very few options. We drank 1 beer and 1 half bottle of cheap wine, still the price was 350US$ for the dinner. The omakase was expensive and worth it. Each of the fourteen courses was spectacular. It was an unforgettable experience. 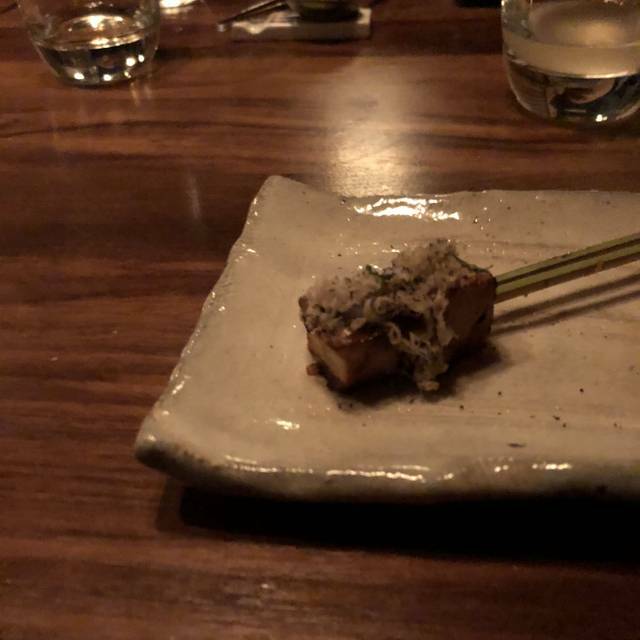 Best Omakase in NYC - and I’ve been to a lot! Our favorite place to celebrate ! Food is to die for and staff remembers the special touches on your special occasions. Extremely pleased with the service , I will keep going for Dinners. Don’t come here if you think you’re going to a sushi restaurant. It is horribly overpriced and ostentatious. Sushi arrives one or two pieces at a time. With a bill of $225 For two people, no alcohol, you leave hungry.The food however is very creative if not eclectic and it’s combinations. It is not the typical sushi or sashimi venue. Be prepared to go out to dinner afterwards. My experience was ruined by our main waiter. He acted very snobbish, condescending and unfriendly all the time, was making myself and my granny feel uncomfortable and like we weren’t good enough to dine at the restaurant. Plus he decided to include an extra bottle of expensive sake in our bill and charge me twice. Food was great though and other ppl were friendly too. It is sad when your dinning experience is ruined only because of one person. Shame. Okay so I've heard about this place for a bit and it has been on my bookmarks for quite some time. We finally decided to visit and I'm going to put it out there, this place is a solid 3.5. But since that's not available, they'll get a 4 for effort. This place is part of a hotel so you'll get the benefit of space. It's roamy and is visually appealing. But if you're a traditional sushi guy, turn the other way now. This place is more about the sauces and modern techniques than traditional flavors and fresh fish. O-ya utilizes high end ingredients with modern flavors and taste. You'll get less wasabi and more truffle oil and foams. This isn't necessarily a bad thing, but it's not traditional sushi. They also start you out on the hot fishes in the omakase which is almost always reserved until the end. In fact, the eel piece was so hot that it burned our tongue. Overall the flavors were great. The presentation was a bit awkward due to the distance between the bar and the work area. And your sushi chefs were Chinese, not Japanese. In fact, there were no Japanese staff at all. 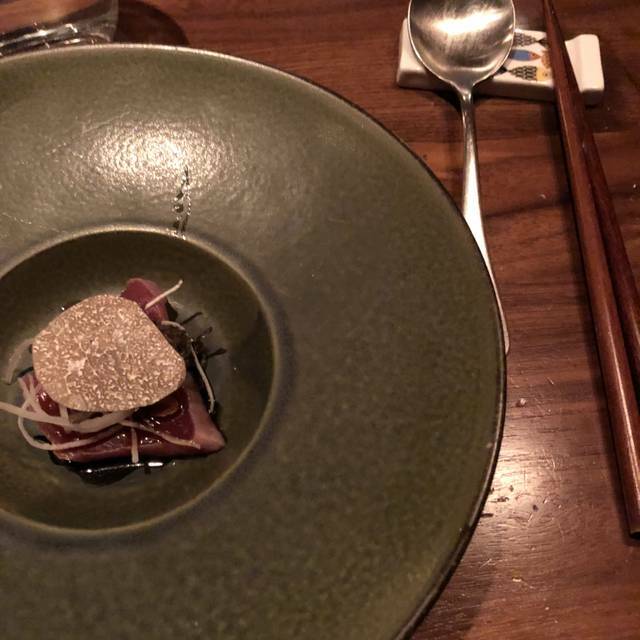 My favorite pieces were the mushroom, the foie gras, and the wagyu. The uni was from Maine so there was nothing special on that front. The aged sake was delicious. Overall the staff was very nice and the effort was great. But for $555 after tax and tip, which includes two 18 piece omakase, 2 beers, and 2 teas; I'd say save your money and go elsewhere. Sorry but O-ya is more like an O-No. This was our 3rd time eating here. The previous visits were fantastic and this meal was just as good, or even better. Highly inventive, exquisitely fresh, food, enhanced by almost letter perfect service. We will return. Have been here up to twice a week. Have not brought a friend who has not gone back on their own. Bar and table seating are both great; there is good space so you don’t feel crowded. The omakase is not too big; you don’t come away feeling too overfull like some other omakase places. A la carte is also a good way to go if you want to double up on the pieces you enjoy the most, but if you have allergies or preferences, the servers will work with you on the omakase menu. Food was innovative, well-balanced and delicious. However, the service was poor. The menu has many choices and a table of four may order 12-15 dishes. The waiters insist upon trying to remember this and not writing it down. Predictable result is that what gets ordered is about a 60% match to what gets brought to the table. Write it down--it's not that difficult. Very Good I was looking for Real High end Sushi in the city and this was my only option I took it and it was very good. I had the Omakase 18 bite size courses but filling. Some of them I had to close my eyes to enjoy fully. I wish they have more raw options. Toro was good. Amazing food coupled wit low to average service. Not for nothing but for the cost of this place service should be impecable as their food. Wonderful dining experience. The food was delicious and presentation was excellent! Perfect restaurant for a date.. the ambiance and service really makes it a special meal. Great omakase courses (except for the dessert). Overall good. It is a cool experience for some of their sushi choices but way over priced considering the ambiance and quantity of the food. You will leave hungry unless you order omakase. But trust me there are tons of places with better omakase and better ambiance than this. This place is overhyped by the eater magazine. It is a small place that has a quite high noise level. The restroom is disgusting, which is shared by a hotel lobby. Not worth.